In addition to their fresh-baked fruit minced tarts, gingerbread scones and butter tarts, they have a wide variety of dinner rolls, breads and baguettes (including their legendary cranberry pistachio French baguettes) to help round out your holiday feasting. 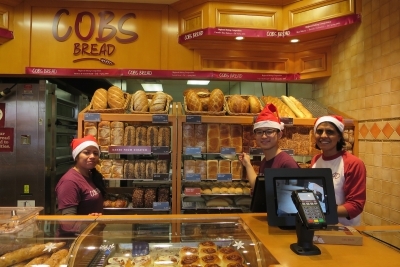 Earlier this year, owner Brinder Bains took over the Cobs Bread location on Robson Street and while the two shops sometimes offers different products, the same dedicated staff, excellent bakers and quality products are available in each location. Recently, Cobs Bread’s Robson Street location came in third place in British Columbia in their latest bread competition. The winning loaf? Sunflower Flax Sourdough. Cobs Bread bakes all their bread fresh every day. At the end of the night, all unsold product is donated to local charities in the community. 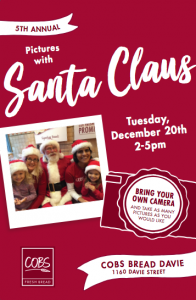 On Tuesday, December 20 from 2:00 to 5:00pm, join the team at Cobs Bread for photos with Santa Claus. For the fifth consecutive year, Santa Claus will take a break from his busy schedule to pose for photos in the West End. This event is free and you’re encouraged to bring your own camera to take as many photos as you like. Cobs Bread is open daily from 7:00am to 8:30pm. Holiday hours: Open 7:00am to 7:00pm on December 24, closed on December 25, and open 9:00am to 8:30pm on December 26.